by Emily Petersen, Community Garden & Education Manager. 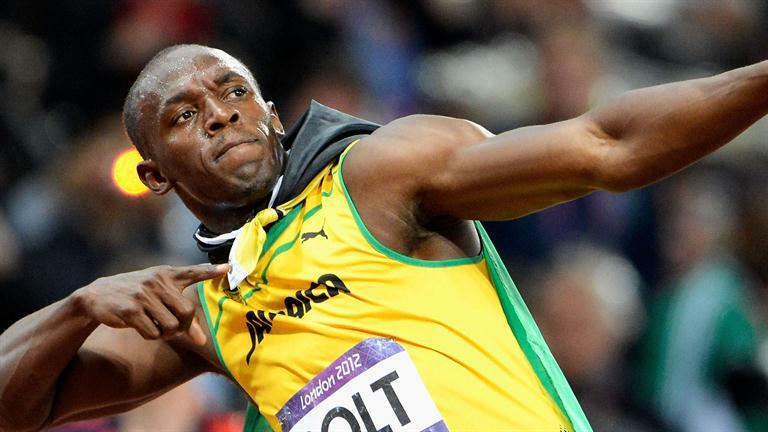 One could say plants are bolting in this heat (nearly) as fast as Usain Bolt, the fastest man in the world. Photo via biography.com. I recently took a trip down to Charleston, South Carolina to visit an old childhood friend. I love travelling there. The city is vitally rich with food and friendliness…not to mention the gorgeous old live oaks (Quercus virginiana) who get their name from being an evergreen species of oak. This means that instead of going dormant and losing their leaves in the winter, these oaks actively photosynthesize and remain green year-round. They are not true evergreens, though, as live oaks still lose their leaves in the spring before budding new ones. As much as I love the city of Charleston, one thing keeps me from wanting to live there: the oppressive heat combined with stifling humidity that plagues the city for half of the year. Just not my bag. The heat was why I scheduled my visit for late May when the weather oscillates around a refreshing 83 degrees with cool ocean breezes. Sounds perfect, right? Here was my expectation: Go down South, feel a little heat and sunshine, then come back up North to slowly transition into summer. Here’s what actually happened: My plane touched down at Bradley late Tuesday night, and by 8:00 am Wednesday morning, it was already 90 degrees and climbing in Hartford. Hotter in Hartford than in Charleston?! I did a quick re-think on the 50-mile bike ride I had planned out for the day once I stepped outside and immediately felt like I needed a nap. By now, we’re starting to get used to1 the push and pull of seasonal temperatures. For us humans, this is a matter of pulling the shorts and t-shirts out of the closet or firing up the air conditioners. Our consciousness allows us to transcend the physiological responses of our bodies, ie: we’ve invented fans we can use to blow cold air on our sweating faces so that we can endure. Plants, lacking this level of entrepreneurship as well as opposable thumbs2, react differently to the heat. If you’re like me, you came back to your garden after a couple of 90-degree days to see your tiny lettuce and spinach seedlings fully grown and sprouting flowers. In the horticulture world, this phenomenon is called bolting. Bolting is a hormonal response by a plant that prematurely produces flowers in an attempt to rapidly reproduce. This process is stimulated when a plant is in stress, induced by changes in daylight, extreme temperatures, or a lack of water or nutrients. The plant releases hormones in the gibberellin family, which regulate developmental processes. The mentality is this: the plant recognizes it is under stress. It does not know if this stress will kill it. In a proactive attempt to maintain genetic presence, gibberellins are released and the plant produces an elongated stem and flower structure, which in turn produces seeds for dispersal. Plants have this survival of the fittest thing down pat. When bolting occurs, the plant diverts all of its energy into producing these reproductive structures. It abandons leaf and root development. As such, the leaves generally become woody and bitter, lacking the usual flow of water and sugars that keep your salad greens tasting crisp and fresh. Though the greens may look the same — take a bite. I’m a fan of weirdly fermented foods and all things bitter or sour. But an accidental bite of a bolted vegetable will make me gag and promptly wash my mouth out with water! Lettuce bolted fast over the weekend at KNOX. Common plants that bolt? Lettuces, onions, spinach, any of the Brassicas, broccoli, and celery. Unfortunately, once bolting occurs, there is not too much you can do about it. 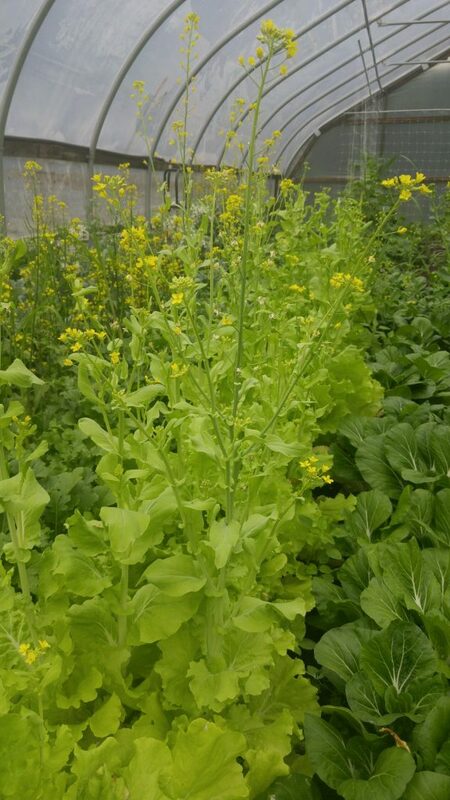 On most lettuces and broccoli, you can break off the flowering stem at the base, giving yourself a few more days to harvest. But you can’t reverse the process. Basil presents an interesting exception. Generally, if you break off the flowering stem on a basil plant after it has bolted, the plant will revert back to putting its energy into leaf growth, and you will be able to keep grinding up the pesto. Best thing to do? Harvest regularly once your lettuces, etc. are mature. Keep an eye on the extended forecast. If you see a temperature shift coming, harvest early. Interestingly, soil temperature has a more potent effect on the release of the gibberellins than air temperature, so adding mulch or a cover crop around bolt-prone plants can stave off the occurrence. All of this to say, if you are taking a vacation this summer, even if it is just for a long weekend, do yourself a favor and harvest your greens prior to embarking. I use ‘get used to’ in a purely colloquial sense here. It is logically contradictory to actually assimilate to the effects of climate change due to its indelibly unpredictable nature. All we can do is adapt. Note: I am not denying plant consciousness. There is scientific research that suggests a unique form of physiological response to emotive stimuli.